During a timely event last Friday at the United States Institute of Peace, or USIP, representatives from Enough Project and Amnesty International’s Adotei Akwei tackled the complicated problem of advancing a lasting peace process in Congo. In light of the expected signing of a new framework agreement, which took place on Sunday, the panelists agreed that there was reason for “cautious optimism.” However, a looming question was how or why this agreement would be different from past failed agreements in Congo. 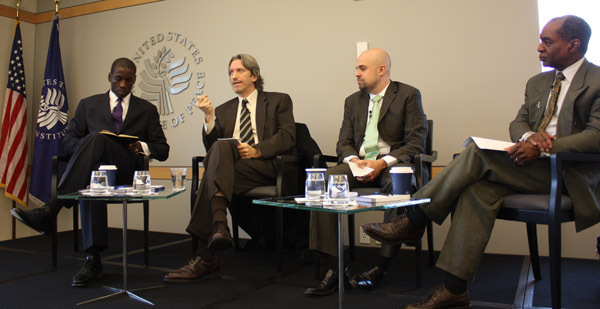 To follow up on this point, moderator Raymond Gilpin of USIP referred to a Reuters report in which the latest Congo peace agreement was described by the M23 Movement as “being similar to ‘arranging a wedding ceremony without the bride.’” Gilpin went on to highlight the fractious state of M23 forces and the uncertainty surrounding their intentions to sign or adhere to the latest agreement. A widely acknowledged need for the restructuring of MONUSCO. Sasha Lezhnev, Senior Policy Analyst at the Enough Project, discussed specific political, economic, and security opportunities, which have the potential to bolster sustainable peace in Congo. These recommendations included the expansion of economic projects outside of conflict minerals, tariff regime reform, and the introduction of measures to encourage and grow responsible, conflict-free foreign investment. Lezhnev and Prendergast noted the importance of having a new U.N. envoy come on board proactively with an agenda and ensure that the parties discuss the key issues needed to bring them to a resolution. In response to questions concerning a cohesive international response to Congo, Prendergast argued for measures of accountability. Highlighting the U.N. Panel of Experts’ implication of “cross-border smugglers and high-level military honchos,” he called for a concerted international response to the illicit actions of spoilers in the Congo. “These are the guys to sanction,” Prendergast stated, noting that as long as the international community continues to drag its feet when it comes to holding key players accountable, the militarization of politics in Congo will perpetuate "dysfunction and deepen the sense that success comes from having militias with bigger guns." During the panel discussion, Lezhnev, Prendergast, and Amnesty’s Akwei issued concluding remarks similar to those echoed by U.N. Secretary General Ban Ki-moon in a high-level meeting after Sunday’s signing. “I therefore call for your sustained political, technical, and financial support, especially over the long-term, to accompany the implementation of the national and regional commitments outlined in the Framework,” Ban stated. The recommendations and initiatives discussed during last Friday’s event remain key issues as the international community moves forward on this uncertain path set forth by the new framework agreement. The appointment of a capable U.N. special envoy to oversee and implement sustained involvement in Congo, a recommendation vocalized by all panel participants, will be a defining factor in the success of any peace progress.